Perennial. Zone 2. Asteraceae. (Formerly Compositae.) Syn. Chrysanthemum macrophyllum. Native from central and eastern Europe to southern Russia; the Carpathian Mountains south to Macedonia. 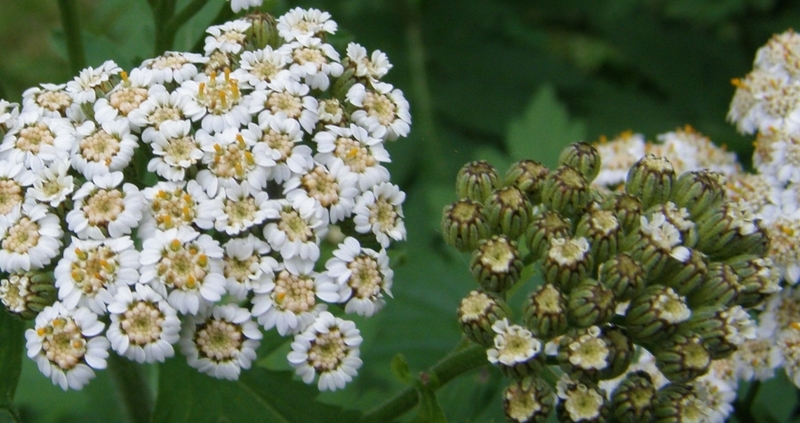 Grey-green, silky-textured, toothed leaves to 8 inches in length line 24 to 36 inch tall stems, which are topped by dense corymbes of ivory-white, yellow-stamened, yarrow-like flowers in June and July. Whole plant is pungently aromatic when touched. I recently came upon an interesting ethnobotanical report from Albania which reports that there is a traditional herbal use for Tanacetum macrophyllum. On St. George’s Day, May 6 – one of the most important rural religious festivals which is focussed around taking the flocks of sheep and goats to their summer pastures – this tansy in combination with nettles is rubbed on the goats’ udders in order to increase milk production. 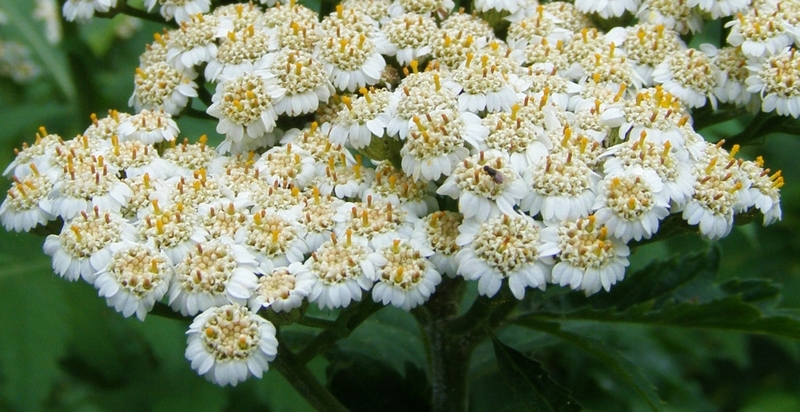 Also on St. George’s Day, a close relative, Tanacetum vulgare – Common Tansy, which we know as an introduced European species whose bright yellow button flowers are a common summer sight along rural Cariboo roadsides – is hung in Albanian and Macedonian stables and on butter churns as a good luck charm for abundant milk production. 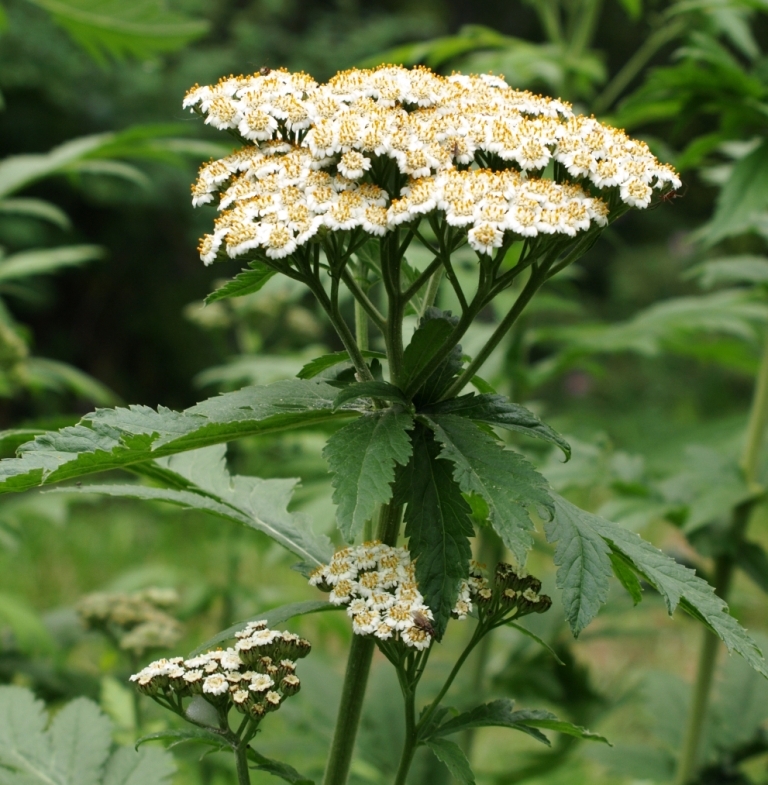 Tanacetum macrophyllum has also been used to produce an essential oil which is being researched for its effectiveness as an antibacterial and antinflammatory. If one doesn’t have a dairy goat around, or ambitions to pursue herbal medicine, one can still enjoy Big-Leaf Tansy in the garden. The early foliage is very lovely, being curled and frond-like with contrasting pale undersides, and the flower clusters quietly handsome in bloom. The bloom corymbs turn a mellow shade of greyish-brown as the florets fade; these can be clipped off for tidiness or allowed to remain on the plants, as they are not at all obtrusive. 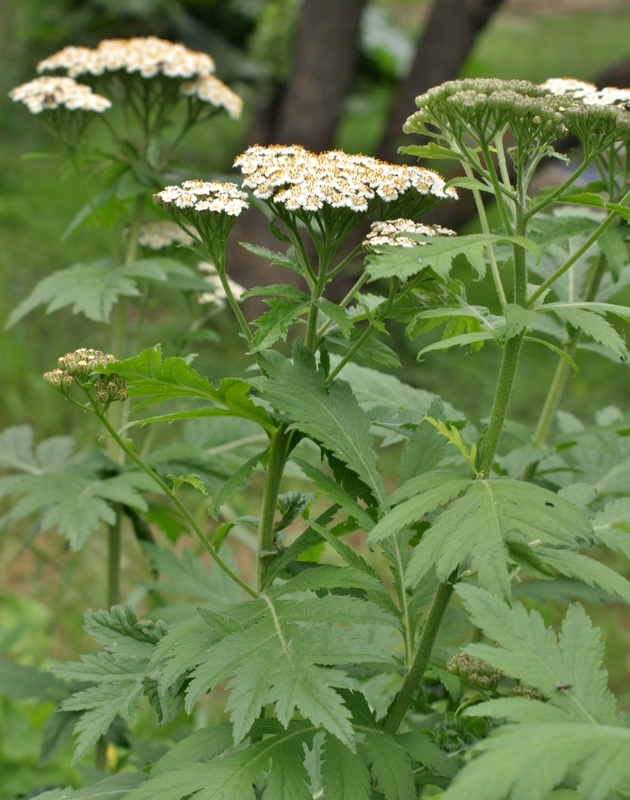 Big-Leaf White Tansy forms a substantial clump in a year or two, reaching 2 feet in diameter and 3 to 4 feet in height. It is healthily vigorous but generally well-mannered. You may occasionally find a few seedlings, but they are easy to trowel out. Mature plants may be divided, the woody centers cut away, and the younger sections replanted. This plant is good in mid-border as a contrast plant to showier-flowered things, and in the herb or wildflower garden. Content in sun to light shade, and very happy with average garden conditions. The richer the soil the lusher it grows, but it is adaptable and can be quite drought tolerant if need be.